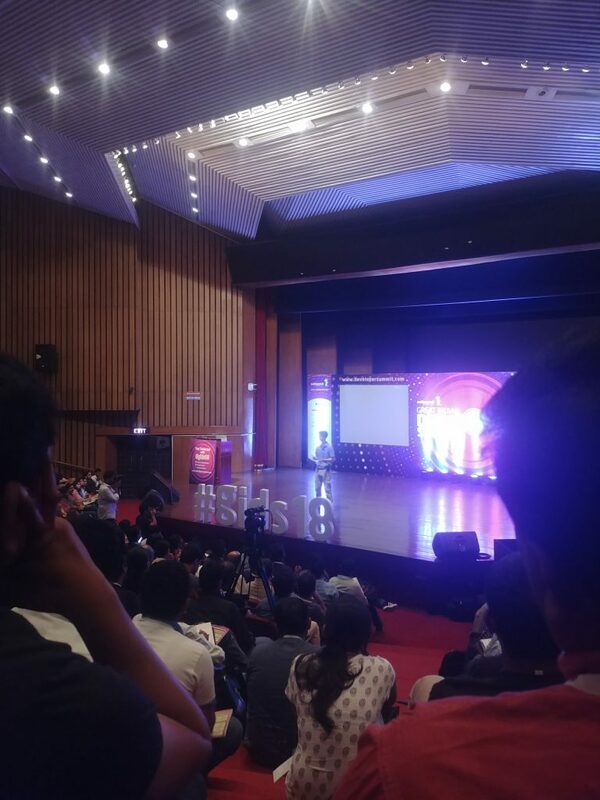 Finally, Great Indian Developer Summit 2018 (GIDS 2018) was here and I am all set to attend the first day’s track : Web & Mobile. What better way to head to a technology conference than to use a carpool app I recently discovered, to share my ride with a fellow summit attendee. 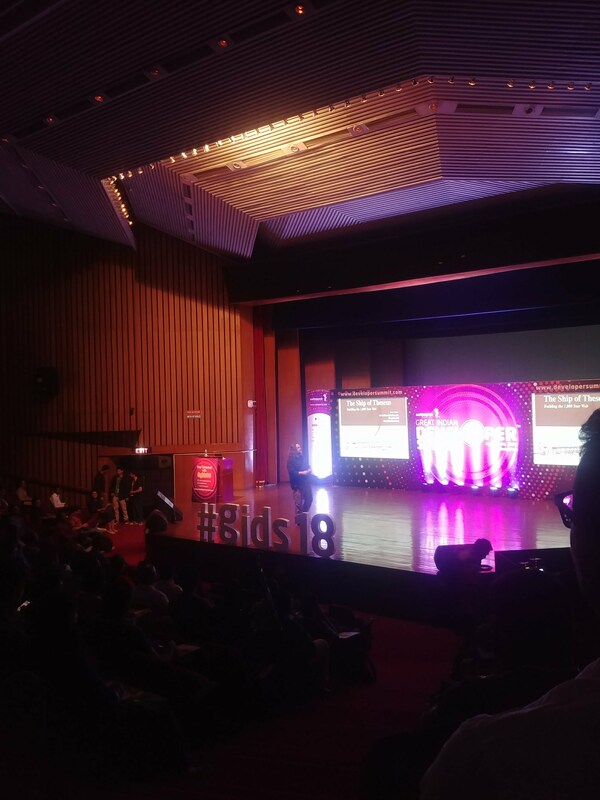 GIDS 2018 is being held at J N Tata Memorial Hall in Indian Institute of Science, Bangalore from April 24 – 28, 2018. I reached the venue just before 8 AM. Check-in and registration were super smooth. Just had to scan the QR code that was sent to me during registration, collect the tag and I’m in. All over in 10 seconds flat. When I got here, quite a few attendees had already come and the hall was beginning to fill up and the sponsors were setting up their booths. 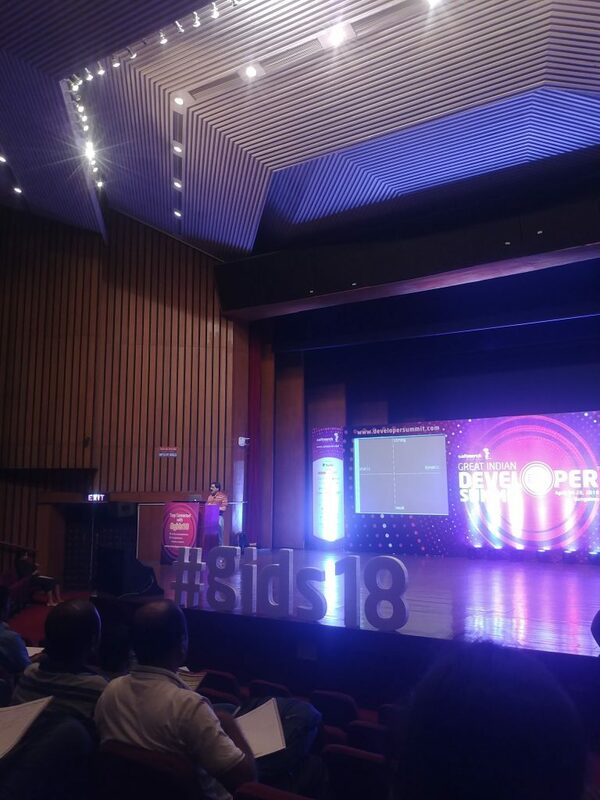 Two speakers that I was looking forward to at GIDS 2018 were Dr. Venkat Subramanian (agiledeveloper.com) and Scott Davis (thirstyhead.com). I’ve thoroughly enjoyed and followed most of Dr.Venkat’s lectures and talks on YouTube and this was my chance to listen to him live! The event began at sharp 8:45 AM like in the schedule. Scott Davis, Principal Engineer at ThoughtWorks delivered his hour long keynote titled ‘Ship of Theseus : Building the 1000 year web’. It was an engaging take on metaphors, how to build tools that last the test of time and how standards (not frameworks) should be the guidelines for software developers. Nick Tran, VP of Developer Marketing at Akamai, delivered the second keynote address. He talked about why mobile performance matters in the current world where every application maker is fighting for the attention of the consumer, who apparently has a lesser attention span than that of a gold fish! 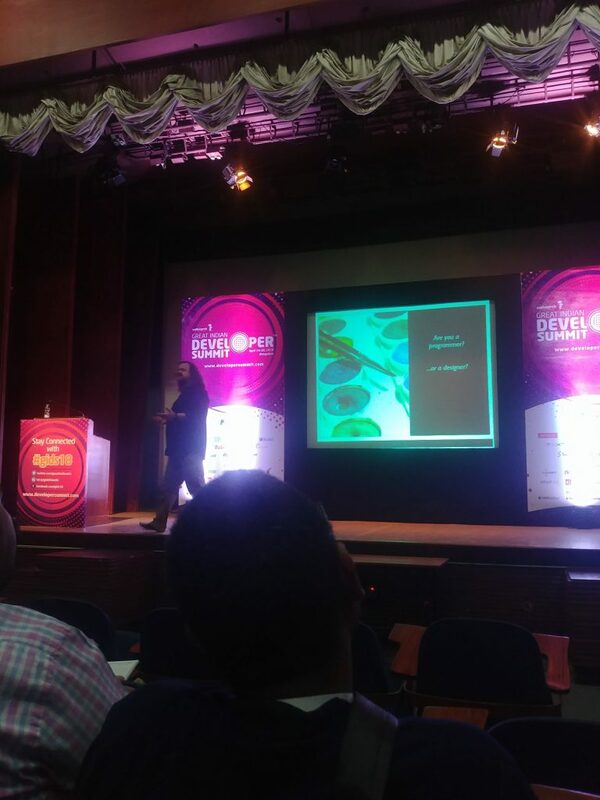 Mr. Alok Kumar, AI Developer at Sapient India delivered the third keynote address. The talk had an interesting title – ‘Presenting the mobile “first” “last” strategy’. He talked about how the technology world’s de facto outlook of smart applications is to interface it with a mobile application and how it is not the best of solutions. I, personally, was so happy to hear somebody talk about this. Fourth keynote address was ‘Public Cloud and Private Cloud Leveraging AWS’ by Mr. Sajid Ahmed, Head of Technology at Goldman Sachs. After some refreshments, we were all ready to attend more focused talks. I headed to listen to Scott Davis talk about CSS for Programmers (2018 edition). He started by enquiring how many in the audiences are programmers and how many are designers. Interestingly, apart from my hands, there were only very few that was raised for both. He went on to talk in detail about how programmers should go about understanding web development and CSS. I thoroughly enjoyed the talk! More about this as a separate post! After that, I headed to Exploring Typescript by Dr. Venkat. He took us through the nuances and features about Typescript in an hour long session where he wrote code live and did demo about every concept that was discussed. Classik Venkat style talk! Loved it!